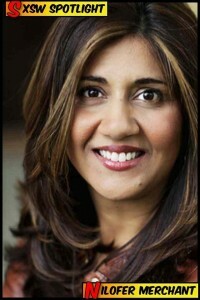 Nilofer Merchant, SXSW Interactive 2012 panelist - Join us in Austin for SXSW Interactive Tech Superwomen panel on March 10! I had the pleasure of hiking the hills of Los Gatos last summer with Nilofer Merchant — an incredible mentor and woman. That hike left me inspired and charged to push forward. Corporate board director for a NASDAQ traded company, HBR writer and TEDx speaker, Nilofer is a heavyweight mentor and champion. Presenting at SXSW this year, she will be speaking as a mentor on the Tech Superwomen, Mentors and Mentees, FTW panel. Nilofer is revealing how mentorship has shaped her career to the TXSW community. Mentorship has entirely shaped my career but not in the way you might imagine. Mentorship is often described as that special relationship of someone more experienced mentoring another. I think of it as learning from everyone. Someone need not have “signed up” to mentor me but I can watch them in action and learn — what are they doing that’s working (or not!) and how could I apply some of that. And then the next day, I would. For example, I used to work with community college leaders and some of the best of those were people who taught me ways to create change on a big scale as we worked on a piece of legislation that reformed the system (AB1725). Martha Kanter was one of those leaders and she currently serves in the Obama Administration. She was never “officially” my mentor but she taught me a lot. It is as easy as seeing someone use facts to convince and I would practice that. Or seeing someone mesmerize an audience and adapt my approach and so on. I have mentors in just about everybody because I am always witnessing and celebrating what other people do well. It does mean that I need to quiet that part of me that gets “comparisonitis” and just challenge myself to be open. In practice, that looks like note taking. I tend to log ideas in my journal (which I am rarely without) after a lunch meeting or presentation and I’ll start to put my brain cycles on that. In 2012, I’m working on improving my headlines and discreteness of ideas so they stand out more in a crowded field of management types. I watch Tony Schwartz (of the Energy Project) and Om Malik who are rockstars at it, and I try and see how they did it and then attempt it. I’m sure someone will think I own this discipline a few years from now but that’s how mentoring works. Join us in Austin for the SXSW Interactive Tech Superwomen panel on March 10!